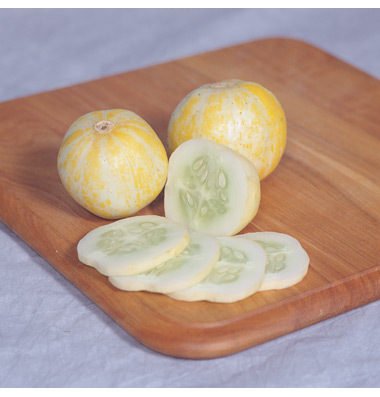 Lemon Cucumbers are true to their name and look like bright yellow lemons, but are very different on the inside. The 3-4 inch fruit are tender and sweet and never bitter. You can pickle them or slice them fresh in your favorite salad. Pick by turning cucumbers parallel to the vine and snapping off with a quick snap. This prevents vine damage. Cucumbers are a tender, warm-season vegetable that can add a crisp cool snap to your favorite salad or sandwich. Days To Harvest: 65 days from seed. Plant cucumbers after the danger of frost has passed. A second planting for fall harvest may be made in mid-July to mid-August. For best yields, add compost or well-rotted manure before planting. Prior to planting, fertilize with a complete fertilizer (10-20-10 or 13-13-13) at a rate of 4 pounds per 100 feet of row. When the vines begin to run, side-dress with an additional 2 pounds per 100 feet of row. Repeat every two weeks on sandy soils and every three weeks on heavier soils. Harvest size depends on the type of cucumber grown. Outstanding Features: Cucumbers are very easy to grow. Pick cucumbers when fairly young to avoid bitter skin. Although the cucumber has a higher water content than most vegetables, you can increase its nutritional value by serving the cucumber without peeling it first. Tips: When the cucumbers mature and are ready to be picked, picking them regularly instead of leaving them on the vine will keep them producing new cucumbers longer. Harvest cucumbers in the early morning and they will be more crisp.